Visit WildCare’s Courtyard for nose-to-beak encounters with its amazing live Wildlife Ambassador animals and learn how they are cared for and returned to the wild. To learn about more amazing animals, check out the Northern California Guide Dogs for the Blind Campus tour. WildCare is a leader in wildlife rehabilitation and nature education. 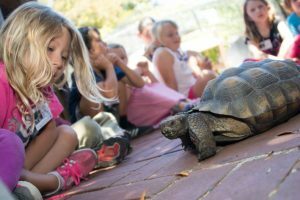 Its Terwilliger nature education programs reach more than 40,000 Bay Area children and adults every year, and its wildlife hospital treats nearly 4,000 ill, injured and orphaned wild patients each year. WildCare's Courtyard is free to visit, and open to the public 365 days a year. Whether you’re bringing an injured animal to their Wildlife Hospital or just looking for an amazing adventure for your kids, WildCare is the right place, located conveniently in downtown San Rafael. Guide Dogs for the Blind's Northern California Campus is located two exits from Downtown San Rafael. It offers a variety of tours for individuals and groups on a regular basis, and graduation ceremonies are open to the public.